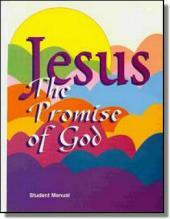 Jesus, The Promise of God (for 4th Grade): The revised manual, with a new cover design, includes a section on the structure and use of the Bible. Photographs have been updated or replaced with new illustrations. A Note to Parents section encourages follow up at home. The popular activity of collecting and entering icons illustrating the life of Christ remains a feature in this book. New and revised activities are included.